Taipei, Jan. 24 (CNA) The new H5N2 and H5N8 avian influenza virus strains recently detected on poultry farms in Taiwan are not transmissible to humans, Taiwan’s Centers for Disease Control (CDC) said Saturday. An analysis of the genome sequence of the viruses indicates that they are of avian origin and entered Taiwan recently, according to CDC deputy chief Chuang Jen-hsiang (莊人祥). The H5N2 and H5N8 strains did not mutate from viruses found previously in Taiwan, he said. The H5N8 virus isolated in Taiwan is highly homologous with the strains found in South Korea, Japan, the United States, Canada and Germany and it shows weak ability to replicate in mammals, Chuang said. Compared with the H7N9 virus that can infect humans, the H5N8 virus is significantly less risky, he said. He stressed the new H5N2 and H5N8 outbreaks in Taiwan are limited to poultry and that there have been no reports of human infection. The CDC will continue to monitor the outbreaks and check for any mutations of the viruses, he added. THE ASSOCIATED PRESS, 01/24/2015: A strain of avian flu harmless to humans has been found at a Foster Farms turkey facility near Waterford. The company’s website says the firm’s early-detection program caught the outbreak in a single, rural turkey ranch, which has been quarantined and the birds to be humanely killed. Federal agriculture officials said the strain detected is H5N8, which is not known to harm humans. The similarly named bird flu strain H5N1 ravaged poultry across Asia in 2003 and is more easily spread among humans. 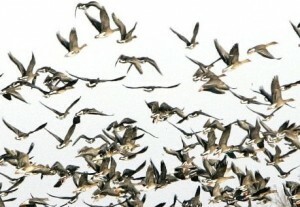 Testing occurred after the flock experienced a spike in deaths. “The good news is it isn’t a human issue, but it is an industry issue because it can wipe out the flock fairly quickly,” said Bill Mattos, president of the Modesto-based California Poultry Federation. Mattos estimated the area-wide toll from an outbreak could affect up to 200,000 birds. “We’ve been watching for this since those cases in British Columbia, Canada, a few weeks back,” Mattos said. 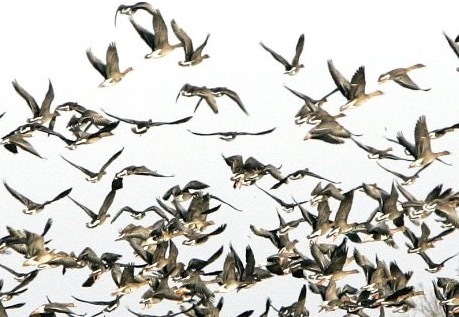 As wild birds migrate along the Pacific Flyway, they bring the deadly disease with them, spreading it where they land or where droppings fall. He urged those with small backyard blocks to keep their birds in coops this winter. Infected birds will die quickly, he said. In mid-December, the U.S. Department of Agriculture reported finding the same strain in guinea fowl and chickens from a 100-bird backyard poultry flock in Winston, Ore. Foster Farms said it reported the outbreak to the USDA. It may be the first U.S. commercial outbreak. According to the website, Foster Farms increased bio-security measures at all its West Coast facilities as soon as the other incidents were seen, working with agricultural and veterinary leaders on prevention measures. “To further protect the health of its poultry and ensure the safety of its products, Foster Farms has long employed strict and industry-leading biosecurity practices including isolation of poultry farms, traffic control and sanitation. The company has maintained a continuous testing program for avian influenza since 2000. Foster Farms is committed to providing premium quality poultry products that are healthy, delicious and safe,” the statement concludes. The outbreak may cause further export problems, however. China stopped importing American poultry products as soon as the outbreak surfaced. Mattos said Stanislaus County farms export only about 1 percent of their poultry, but nationwide some 30 percent of the flocks are sent abroad. The 200,000 turkey total is almost as large as the H5N2 outbreak in British Columbia, which involved 12 farms and approximately 250,000 birds. The APHIS announcement has already led to the banning of the import of California poultry to Japan, and the upcoming OIE report will likely lead to a major series of updates by other countries imposing similar bans. The size of this H5N8 outbreak highlights the potential damage to the poultry industry in California, which is significantly larger than operations in Washington, Oregon, Idaho, and Utah, where prior H5N8 outbreaks in wild birds or backyard farms have been reported. The latest reported outbreak in California suggests more infected farms will be reported in California in the near term. Based on publications on Reconbinomics.com and WATTAgnet.com, January 14, 2015. The appearance of the two Fujian H5 serotypes in Taiwan raises concerns of a significant global expansion, which is supported by the detection of two Fujian H5 serotypes in the US (also H5N8 and H5N2). H5N2 has also been reported in British Columbia, less than 7 miles from the wild bird positives in Washington, but Canada has not reported H5N8 or H5N2 raising serious surveillance concerns. 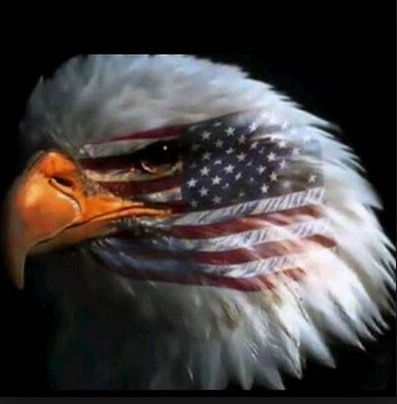 Moreover, neither Canada nor the US has released any H5N2 or H5N8 sequences with Fujian H5. A far more aggressive surveillance program under wild birds the throughout US would be useful to demonstrate the potential threat of outbreaks is taken serious. Migratory birds might have introduced the virus, but it is absolutely not clear whether or not also stand birds have become carrier of the virus. In that case, the virus might be easily transmittable to the US poultry heartlands. These surveillance concerns are also present in European countries reporting H5N8 in commercial farms, but no reports in wild birds (England and Italy) as well as neighboring countries who have not reported H5N8 cases. The recent report of HPAI H5 in Nigeria also raises concerns that H5N8 has migrated to Africa in the absence of any reports for eastern Europe, the Middle East, or northeast Africa. 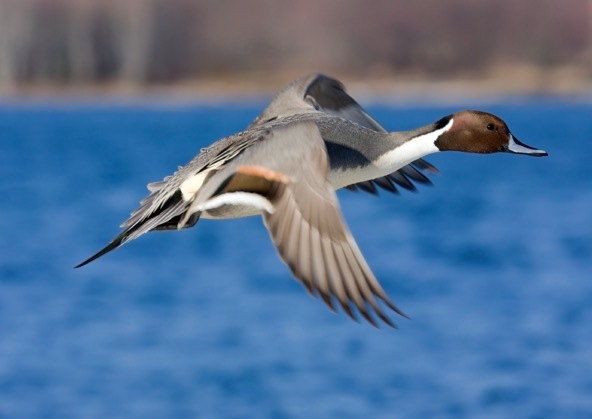 The above comments by the Utah Department of Agriculture and Food confirm the presence of H5N8 in a hunter killed widgeon in Davis County near the Great Salt Lake. 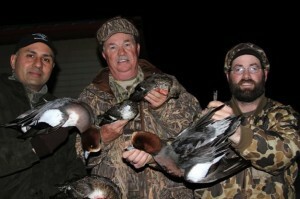 The January 9 confirmation date by the FDA in Iowa suggest that the January 7 warning to hunters people with backyard flocks was linked to PCR confirmation by the Utah State lab, The January 7 warning noted recent confirmation of H5N8 and H5N2 in Washington, Oregon, and California in backyard farms and wild birds. The location of the Utah widgeon is near the border of the Pacific and Mountain flyways and is the farthest east (see H5N8 map and H5N2 map), which suggests there will be additional detections in the near term, which will undermine USDA efforts to convince other countries from banning imports from the United States. In its most recent OIE filing, the Butte County, California location of the H5N8 gadwall was withheld, but China subsequently banned imports from the US because of Fujian H5 detections in multiple states (which increased to four states with the latest confirmation). The confirmations thus far have been limited to wild birds and smaller farms, although the farm in Richland, Washington had 500 birds, which were raised for commercial purposes, although the USDA maintains that farms with 200 or 500 birds are not commercial farms. Surveillance worldwide remains suspect. Although Canada has detected H5N2 in 12 farms in British Columbia, they have not detected H5N2 or H5N8 in wild birds. Similarly, Taiwan failed to detect and/or report an Asian Fujian H5N2 and H5N8 prior to massive infections throughout the western side of the island and no cases have been reported in Fujian Province, less than 80 miles from Taiwan. The reports of H5N8 in countries in Europe and North America, as well as Asian locations such as Taiwan, raises concerns of a global spread, which may dramatically increase if the H5 in Nigeria is also H5N8. It spite of this dramatic spread, none of the sequences from North America have been made public by Canada and the US. Release of these sequences as well as those in Taiwan would be useful. The public sequences have all lost the glycosylation site ate position 158, which is associated with increased gal 2.6 binding, and H5N8 infections in dogs, mice, and rats has been noted. The US industry has been hit hard by the current outbreaks. The Chinese government will ban all imports of U.S. poultry and egg products because of recent detections in the U.S. of highly pathogenic avian influenza (HPAI) in backyard poultry and wild birds in the Pacific Northwest. Taiwan is facing the dramatic spread of H5N2 and H5N8. The number of suspect farms has increased from 38 to 65 and the number of confirmed farms has increased from 9 to 20 in one day. These increases support media reports stating that initial cases may have been noted as early as October, but was being unsuccessfully managed in farms which failed to report unusual deaths or dramatic drops in egg production. (Translated from the publication in NowNews, Taiwan) Domestic bird flu siren, waterfowl industry is facing the most serious outbreak of bird flu over the years, anti-seizure Bureau today (January 13 2015) announced the latest test results, Yunlin and Chiayi diagnosed then add 11 games goose games, Taiwan estimated to cause 270,000 goose loss; in addition, the submission of new cases and 27 field sampling Bulletin, Taoyuan and Kaohsiung City also received a suspected outbreak, Tainan add a chicken farm, a total of 65 games in Taiwan seven counties abnormal mortality epidemic outbreak. According to the Bureau of Statistics to anti-seizure ended today 11:00, 11 new confirmed again today goose games, including seven new Yunlin County, Chiayi County, two games, two games in Pingtung County; COA confirmed that this wave of bird flu Waterfowl the first time the most serious outbreak, Taiwan has had 20 confirmed cases of the field is expected to affect 270,000 geese production. COA noted diagnosed games in 14 games for the new H5N2 subtype avian influenza, six games for the H5N8 subtype of avian influenza; Cai Xiangrong, director of animal health instructions, H5N2 is the country’s second case of a pandemic virus infected waterfowl ducks and geese, is The most serious outbreak first waterfowl, the present value of the peak of the epidemic, the diagnosis field more for the high incidence of goose farm suspected of geese spread of infection. COA chairman Chen Bao-ji also appeared today in the press conference after the animal epidemic prevention group meeting, Chen Bao-ji said two years ago that have informed the H5N8 outbreak began around through e-mail, conference materials in both statistical frequency; the face of an outbreak, vaccination will be the highest specifications measures with increased culling, please contact the EPA and does not rule out additional military assistance disinfection and treatment of animal carcasses, the first time control, “Let the virus disappeared from Taiwan,” the future of open farms and strengthen protection of migratory birds. Focus Taiwan, Taipei, by Yang Shu-min and Elizabeth Hsu. Jan. 11 2015. A new type of the H5N2 avian influenza virus detected at goose farms in southern Taiwan has never been seen before, the director-general of Taiwan’s government-run Animal Health Research Institute said Sunday. Tsai Hsiang-jung said the H5N2 subtype flu strain is a recombinant virus, and “after reporting the case to the World Organization for Animal Health, it will be the first of its kind in the world.” The Bureau of Animal and Plant Health Inspection and Quarantine under the Cabinet-level Council of Agriculture confirmed Sunday an outbreak of the new H5N2 strain at four goose farms in Yunlin County and a duck egg farm in Pingtung County. 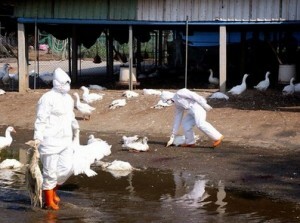 It also confirmed an outbreak of H5N8 avian flu at a goose farm in Chiayi County. A total of 24 farms raising ducks and geese around Taiwan sent tissue samples to be tested amid suspicions that their birds may have been infected with avian flu. The outbreak started on Jan. 8 at a farm in Da-Lin Township, Chiayi County and killed 3,683 out of 5,200 birds, the Taiwanese authorities said in a report to the Paris-based OIE. The strain is the same as in other cases found in Europe, North America and elsewhere in Asia in the past year. Six farms were found to be infected by two viruses that had never been detected in Taiwan before, the bureau said. After analyzing the new H5N2 subtype, the bureau said the H5 subtype was 99 percent similar to that seen in the H5N8 flu virus that attacked South Korea in 2014, while the N2 subtype was 96 percent similar to the virus that hit China’s Jilin Province in 2011. The H5N8 infection found in tissue samples from geese raised on a farm in Dalin Township in Chiayi County was identified as similar to the South Korean H5N8 avian flu virus, according to the bureau. The H5 subtype is 99 percent similar to the Korean strain, while the N8 subtype is 98 percent similar, the bureau said. 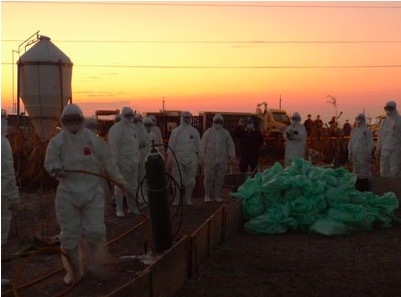 Both the new H5N2 and the H5N8 virus strains are highly pathogenic, the bureau noted. Contacts between people, equipment and vehicles prior and during outbreak situations are critical to determine the possible source of infection of a farm. Hired laborers are known to play a big role in interconnecting farms. Once a farm is infected, culling entire flock is the only option to prevent further spreading with devastating consequences for the industry. 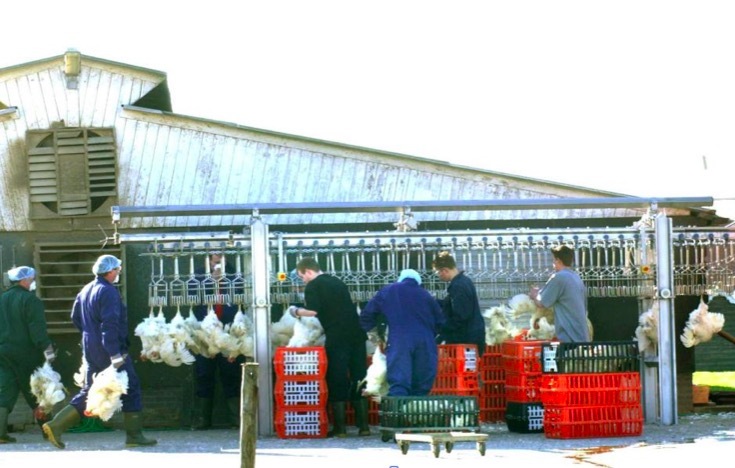 In this paper, based on the HPAI outbreak in Holland 2003, the researchers found that 32 farms hired external labor of which seven accessed other poultry on the same day. However, they were not the only ‘connectors’ as some (twelve) farmers also reported themselves helping on other poultry farms. Furthermore, 27 farms had family members visiting poultry or poultry-related businesses of which nine entered poultry houses during those visits. The other enhancing factor of farm interconnections was the reported ownership of multiple locations for ten of the interviewed farms and the reported on-premises sale of farm products on one pullet and eight layer farms. Also worth mentioning is the practice of a multiple age system reported on eight of the interviewed farms as this may increase the risk of infecting remaining birds when off-premises poultry movements occur. AI viruses may be introduced into poultry from reservoirs such as aquatic wild birds but the mechanisms of their subsequent spread are partially unclear. Transmission of the virus through movements of humans (visitors, servicemen and farm personnel), vectors (wild birds, rodents, insects), air- (and dust-) related routes and other fomites (e.g., delivery trucks, visitors’ clothes and farm equipment) have all been hypothesized. It is therefore hypothesized that the risk of introducing the virus to a farm is determined by the farm’s neighborhood characteristics, contact structure and its biosecurity practices. On the one hand, neighborhood characteristics include factors such as the presence of water bodies (accessed by wild birds), the density of poultry farms (together with the number and type of birds on these farms) and poultry-related businesses and the road network. The use of manure in the farm’s vicinity is also deemed to be risky. On the other hand, contact structure risk factors include the nature and frequency of farm visits. Therefore, a detailed analysis of the contact structure, including neighborhood risks, and biosecurity practices across different types of poultry farms and poultry-related businesses helps the improvement of intervention strategies, biosecurity protocols and adherence to these, as well as contact tracing protocols. Farmers’ perception of visitor- and neighborhood-associated risks of virus spread is also important due to its relevance to adherence with biosecurity protocols, to contact tracing and to communicating advice to them. The former entail the target farm’s exposure through incoming contacts (human and fomite), through inputs such as feed and egg trays and through neighborhood-related risks such as air-borne contamination. 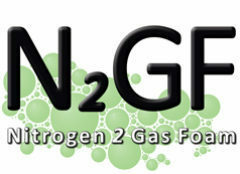 The latter can be through farm outputs (waste and non-waste), outgoing contacts (human and fomite) and contamination of the neighborhood (e.g., through emissions from the farm). Therefore, all day-to-day farm activities involving people and/or materials and/or equipment going in or out of the farm were systematically analyzed. High pathogen AI in the US: No surveillance – no outbreaks? Although the US has reported three different isolates in two states, there have been no reports of outbreaks in commercial farms. Similarly, although Canada has reported H5N2 in 12 farms in British Columbia, there have been no reports of H5N8 anywhere, and no reports of any Fujian H5 in wild birds. These absences raises serious concerns about the level of surveillance and the true distribution of H5N8 and H5N2 in North America.